The tailstock of a lathe can be used for drilling, with the aid of a drill chuck attachment. 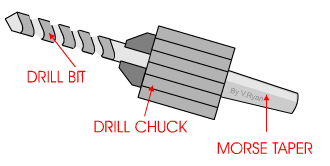 The drill chuck has a morse taper shaft which can be push into the shaft of the tailstock, locking it in position. The usual starting point for drilling with a centre lathe is to use a countersink bit. This is used to drill slightly into the material and creates a starting point for other drills that are going to be used. Attempting to drill with a traditional drill bit without countersinking first will lead to the drill bit slipping straight away. It is not possible to drill a hole successfully or safely with out using a centre drill first. If a long piece of material has to be turned on a lathe then a centre drill is used to produce the hole at one end. This allows the drilled end to be supported by the tailstock centre. Once a hole has been produced by a centre drill, machine twist drills can be used to enlarge the hole and if necessary to drill all the way through. If a large diameter hole is needed then a small hole is drilled first (eg. 4mm dia). Then the hole is enlarged approximately 2mm at a time. Trying to drill a large diameter hole in one go will inevitably lead to the drill bit over heating and then jamming in the material. This is potentially dangerous. When drilling, it is very important to use soluble oil as a coolant. This should be constantly fed onto the drill bit to keep it cool. This will help prevent jamming and over heating. Over heating will blunt the drill bit quickly. Using diagrams, explain the stages involved in the drilling of a hole - using the centre lathe.